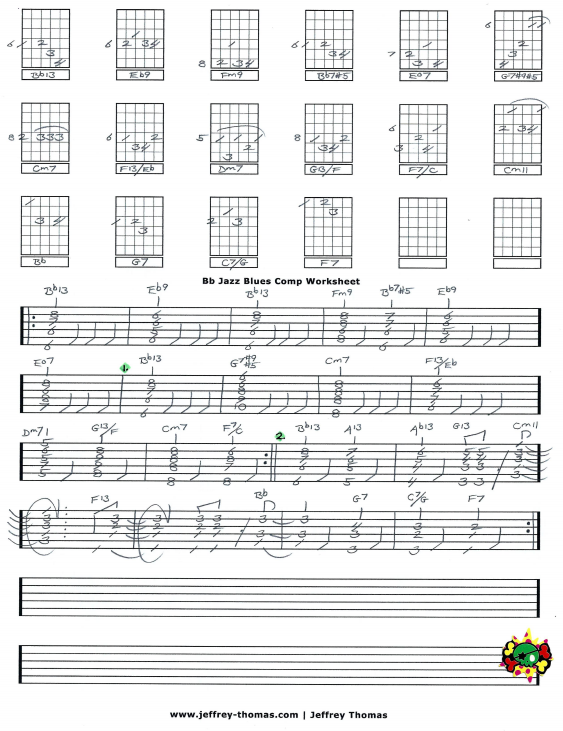 Bb Jazz Blues Free Guitar Tab by Jeffrey Thomas. This free guitar tab shows many common chord changes for jazz blues. I kept the rhythm pretty basic so the student can concentrate on either pick or fingerstyle approach to the chords. I have my jazz guitar students concentrate on playing solid rhythm before we move into creating solos. Want the full guitar tab for free? Just send in your email address through the form provided. Looking for jazz guitar lessons? Make sure to fill out the Schedule A Free Lesson form to set up your free Skype jazz guitar lesson. This free jazz guitar tab will show you the right changes and have you sounding great! Check out my tab, blog and video pages for more great online guitar lessons.